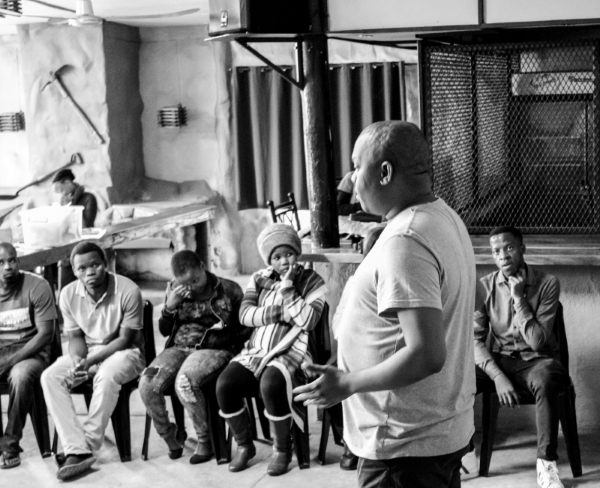 Introducing the Team is a monthly post in which we will introduce one member of the Dlalanathi team. Every member of our team is highly skilled with lots of incredible stories to tell, so don’t miss these! What is a ‘typical’ day in your working life? I am responsible for the overall management of the youth team, balancing the administration tasks and community work that needs to be done. I ensure that our team has plans and clarity about what to do on a daily basis. I ensure the environment is conducive to our work, for example by communicating and building relationship with Indunas (traditional leaders) in the community who are gatekeepers in the community for our work. I work with the Pillars of the Youth Process, namely the Youth Network, and provide support to them. I also keep my eye on the ground in terms of other NGOs and what they’re doing in the youth sector. I also work with local government through structures such as War Rooms to ensure we are engaging with issues that impact youth. Overall, I give support to the team and to local structures. I also deal with individual cases where youth are in need of referral, support and follow up for a wide variety of issues. What has been a memorable moment in your work in the past month? Leading the two evaluation camps (evaluation of the 2017 youth process) with “out of school youth” this past month. These camps gave us a full picture of how youth have received our inputs; many say they have been discovering who they are and they have been able to take action in their own lives. Many told powerful stories of impact. I loved that they could voice their appreciation of themselves, to themselves. The feedback on where they were compared to where they are right now was encouraging. For example, hearing a young person say that they did not know what they wanted to do in life, only that that they wanted to be successful, but they didn’t have a plan. Then, attending trainings gave them the focus and now they have a career goal. Through the trainings and process they were able to decide what they wanted to do, it has helped them to take a step and knock at the door, and they now have access, whereas before they didn’t even think it was a possibility. They have built social connections with others, initially they thought about themselves only, but began to see the importance of connecting with others, including their families and friends. This makes it really feel like our process is completely worthwhile. We may not feel like we are where we want to be in terms of the whole of society, but we are being a light where we are. What is one challenge you have had to contend with in this role? We really want to provide a caring environment, but at times we also have to deal with issues of conflict. We have to try to get that balance between being caring and also being firm with young people when they are negatively impacting themselves or others in the process. For example, if somebody becomes overly arrogant and this is starting to affect the rest of the group and brings in conflict in the rest of the group. You want to take a neutral position but you also want to be firm about what is it that needs to be brought into this space so that there is a workable solution. One comes with such passion to see things change and to transform in a positive way, but it’s not a once-off thing. It has to take certain processes, it’s going to take you to become firm and honest with your own beliefs. And also, to think about how to deal with issues in a way that is developmental rather than top down discipline that will possibly disengage people in the process. Please share a story from the field… I’ll share just one, there are many! The critical part of our work is that people have dreams, but they’re stuck. How do they unlock them? Through the support that we give them and other opportunities they are given. Business skills are not our area of expertise but we know who to refer young people to for those skills. So, in this story, this young man is a very resourceful person and a support for other young people who would like to start businesses. What motivated you to go into community work/youth work? When I was at school, I was a very naughty guy. I am now a polished diamond but I used to be a very rough one! There are key people in my school life that gave me mentorship and supported me when they realised I have potential but was just going in the wrong direction. I had the chance to become a class rep, I began to take responsibility from then on. It shifted the way that I was thinking about things and gave me a reason to start supporting other people. I started reflecting on my own life and thought “If I can change, and I was supported to change then I can also support other people towards change.” This became my passion in life. I love working with people, even with all its challenges. And what keeps you going? If I look at the context of our country, and of our community, I always say the problems are big, or may look big, but the solutions are simple. And that is what keeps me going. In youth development you don’t have to do a whole big task or programme. What you do is inspire confidence in young people, you stand aside and that is enough to help them do something because the confidence brings energy, the energy transforms into actions that they take, and those actions you support, acknowledge and celebrate with them. And in youth development, that is what we need to do so that people begin to realise their own potential, and become light to others in their own communities. And that is always what we have done in this youth project. We don’t tell people what to do, but it happens like it’s a miracle! What three words describe you when you’re not at work? Fun, analytical, relaxed!